Family road trips: memories to treasure forever or the stuff of nightmares? To be honest, probably a bit of both. But if you approach your road trip with the five P’s (planning, packing, preparing, playtime and patience), it could turn out to be the trip of a lifetime. Here are tips that will guarantee a family road trip you’ll remember — for all the right reasons. Spontaneous stops are all well and good, but if you feel nauseous at the mere thought of driving your kid to the next town, let along across the country, without snacks, get planning. You don’t have to have everything set in stone, but if you know in advance where you want to go, where you’ll stay and what attractions you’ll visit when you get there, you’ll feel more relaxed about the whole experience. Kids will be more excited about your trip (and more bearable during the journey) if you ask them to help you plan. So, crack open a guidebook or get a-googling together to choose your stops and more. Or if you’ve taken this particular road trip before, ask the kids which rest stops and play areas they liked the most last time. Knowing you’re going to stop there can keep them going on those long stretches of road. You’ve made your checklists and packed your bags — but before you cram them into your car, think about what you’ll need during the journey. Snacks, toys, audiobooks, rest stop jackets and sneakers, diapers, baby wipes, hand sanitizers, socks, trash bags and overnight bags should always be within easy reach. And how you pack the car itself can actually make your kids more comfortable, say Leavitt and Walton. Place suitcases or sleeping bags under their feet to give their feet something to rest on, and put cozy pillows against the windows for kids to lean on. Children and cars can get along great — as long as the kids have plenty to entertain them. First of all, let each child choose a favorite stuffed toy or comfort item to keep them company on the road. Invest in some new toys if you can; never underestimate the power of novelty items. A range of small travel-size toys (think miniature dolls, squeeze toys, lace boards, sticker books and magnetic doodlers) gives your rear-seat passengers plenty to take their minds off the long journey ahead. A little creativity can go a long way on a road trip. 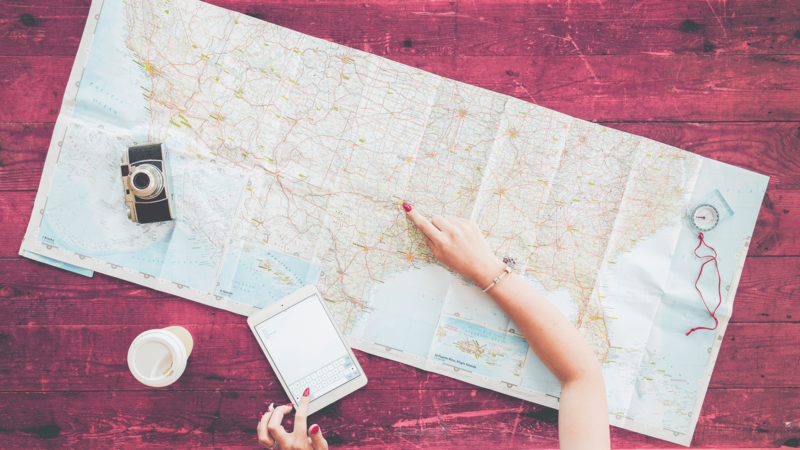 Mom of three and founder of Excited2Learn Amanda Carman kicks off a road trip by giving her kids their own map highlighted with specific town names or landmarks to look out for along the way. Whenever they reach a highlighted spot on the map, they get a surprise (a favorite snack, a game, window clings, a CD or audio book or a small wrapped gift to open). If the road trip favorite “I Spy” makes you want to rip your hair out, give it a twist that’s strictly for kids. All they need is a notebook, a small envelope of pictures of things to spot (a large tree, a blue truck, a bridge, etc.) and a glue stick, says Carman. They use the glue stick to add pictures to the notebook as they spot the items. Think about how extended periods of screen time affect your child. If more than an hour makes them irritable or restless, restrict them to short bursts of electronic play. And if you feel guilty about your kids having any screen time on the road at all, you can always install educational apps or books and games related to their school projects. That’s got to help, right? More: How Much Is Too Much When It Comes to Sharing Your Kids’ Lives on Social Media? Spending too much time sitting in a car is no good for anyone. Take regular rest stops, and when you do, keep the kids active. Carman swears by jumping jacks, running loops in an open field, dancing and stretches to ensure your kids use up some of their energy reserves before they get strapped back in. We know taking a long road trip with kids can be stressful, and no matter how well prepared you are, it’s probably never going to go exactly to plan. In moments of tension, take a deep breath and remember, if your kids are warm, comfortable, well-fed and entertained, they don’t care about much else. Happy road tripping!